Although this post is not directly related to personal finance issues, it does have something to do with it in terms of your financial security. For a long time now, I have had emergency kits in my car and in my home in case I suddenly had to vacate the house or got trapped away from home. After 9/11, the tsunami in Thailand, Hurricane Katrina, and the earthquakes in Haiti and Chile, I figured that if it can happen to all of those people then it can happen to me. We all go through life figuring that the bad stuff always happens to other people, but someday the other people could be you and you better be prepared. Cash – $200 in small bills if not more. If tragedy strikes, banks and other electronic payment systems may be down and if that happens, cash is king whether for food, water or gasoline. Food – MRE’s (Meals Ready to Eat) that could last 2 weeks if I ate them sparingly. These are loaded with carbs and calories to keep you going, and they last on average of 5 years. Water – Besides a bunch of small water pouches (think Capri Sun or the like), I also have a bottle for water and water purification tablets if I run out of my own water and need to sterilize water from another source. Clothing – A complete change of clothes consisting of socks, underwear, sweatshirt and hat. I also have gardening gloves in case I need to deal with something rusty or sharp. A rain poncho was thrown in for good measure as well. First Aid Supplies – Band-Aids, Neosporin, gauze pads, wrapping tape, razor blades, small sewing needles, a compass, ace bandage, etc. I also have candles, lighters and matches, glow sticks, etc. 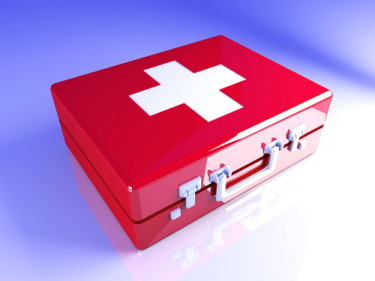 Medicine – If I have a prescription medicine, I make sure I have a bottle of it in my kit. According to my doctor, pills that are solid (not the gel liquid kind) last WAY longer than the expiration date on the bottle. So I make sure I have backup pills in the bags that will last until I can get my hands on more. Personal Documents – This is where the personal finance aspect of this post comes in. In my bag, I have a small ziploc baggie filled with photocopies of my driver’s license, birth certificate, social security card, a few of my credit cards and a contact list. I also put a USB thumb drive in this bag that has the same info on it as above but also has all of our financial account numbers, phone numbers, insurance cards, first aid info and local emergency information. This usb key is the key to your recovery after an incident, as it allows you to have one place where all your information is stored. Communication – I carry a windup emergency radio that has weather and other bands, and also has a flashlight attached. I also have a solar battery charger to charge my cellphone in case the juice runs out before I can find power. Protection – I have mace and a rather large knife that can cut food, wires, etc etc in case I need it. You never know what may happen once the SHTF! In my closet, stored in a big old WWII trunk my grandfather gave me, is all the stuff I would need if I had to stay in my house with no food, water or electricity for a while. I have a duplicate set as above, but with way more water, food, blankets, candles, an old telephone that doesn’t need electricity to work and assorted other things. Oh, and I have a giant axe, too…just in case. Some of my friends think I am a little over the top, but I would much rather be over the top and ready than not have anything and depend on the kindness of strangers in an emergency. You do not know how people will react if something really bad happened, and I do not want to find out. I want to be completely self-sufficient and ready for anything. Living through 2 pretty big earthquakes back in CA has taught me that stuff can happen at any time and you are never ready for it. But having the backup materials just in case is definitely a start. The way I am set up, if I lost everything, I still have everything I need to re-start my lives… I can get on the phone right away with my financial/insurance companies and get the ball rolling on any help I might need. I cannot stress enough for people to be ready….and if you still do not do anything, be sure to have backup copies of your important documents in several places. If a fire struck your residence, you might lose everything. So be sure you have a backup you can turn to to start getting your life back in order. Buy yourself a USB drive, put your docs on it, encrypt it, and throw one in your desk at work or your daily bag you carry. But that is the bare minimum; think of the people that went through Katrina and then imagine something like that happening to yourself. Would you be ready? bringing you informative personal finance content and helpful tools, as well as the best interest rates on financial services nationwide. Follow them on Twitter at @GoBankingRates. Being Positive Brings Good Things To You. Good article. More people should heed this advice. I don’t think the points listed here or your personal list are over the top at all. This was my last year’s resolution, and I am happy to say that it actually got taken care of. When I first saw the title to this post, I began to dismiss it as unnecessary. Then I began to think about it. All of this would involve virtually no costs and could probably save a life, should something ever happen. I completely agree with your post. I started talking about having emergency kits with three of my co-workers, and to my surprise they all said that they didn’t have one, and only one person thought it would be a good idea. The other two looked at me like I was crazy. I feel the same as you – better to be prepared! Thank you for your practical posts! I completely agree with you your article should be read by every one. This is a wonderful list! Living in Florida requires an emergency kit and we find that camping supply stores like Gander or Coleman are great for almost everything you need! I agree with your post 100% and I certainly appreciate the list. Mace is a great call because in a true disaster, it can come down to every person for themselves. One question: Do you ever worry about your car being stolen and having all of your info so easily accessible to the thief?